We are currently rated 4.83 out of 5 based on 86 ratings and 60 guest reviews. We want to recomend Almanii B and B in every possible way! Close to Dublin city centre by bus, lovely tasteful breakfast and nice clean rooms. The owner, Mary is such a helpful and nice person, her service and help is just excellent! If you want a nice memorable stay in Dublin, look no further! We Loved staying in this b&b Mary is very kind and friendly. The house was clean and very well keeping. Breakfast was Amazing! It is near airport and it is at 15 minutes to the center by bus. We felt like staying in our home! We enjoyed our stay at Almanii for the 2nd time awesomely! We recommend it to all visitors to Dublin. Our stay at the Almanii B&B was super. Mary is a great host and helped us with planning in Dublin and also a trip to Howth. The B&B was spotless overall, the full Irish breakfast was really good with the added bonus of home made bread! The rooms are really nice and excellent powerful showers. The bus stop is just over the road with numerous buses in / out of Dublin which takes 10 - 15 mins. Taxi back from Dublin centre was 15 euro. We thoroughly enjoyed our stay and would highly recommend a stay at Almanii B&B. Thanks Mary! Very nice B&B. Comfortable, clean room with great breakfast. Host, Mary, is friendly and very helpful. Good location for access to town and the airport. Mary was very friendly and gracious and my daughter and I were very comfortable in her lovely home. We had a very early flight, but Mary arranged to have a Taxi there at 6:15 am and made arrangements with us the night before to provide a light, early breakfast for us even though they would not be up yet. Also, Mary went above and beyond what would normally be expected and helped me to find my camera, lost in the taxi, after my return home and send it to me. I would stay there again. Thank you Mary! The Almanii Band B is a very clean and lovely place. The owner has put iin details that make it pretty and very well thought out. Mary, the owner, couldn't have been more welcoming, hospitable, and helpful for 2 dazed (just off the plane), new arrivals from the U.S. Her help with city bus details, local restaurants, and other tips made negotiating Dublin much easier. Her breakfasts were superb. Thoroughly enjoyed our time at Almanii B & B! Mary was most hospitable and worked hard to meet our every need. The house is close to public transportation and in a quiet residential neighborhood. Breakfasts are hearty and enough to allow us to go without lunch most days! Would highly recommend! Very nice and tasteful room, very clean, perfect location between city centre and airport. The beds are absolutely comfortable, this was one of our best nights without any back aches in the morning. Our host was very friendly and gave very good advice on how to get to the centre and the airport. Nice breakfast. Excellent stay.....Mary is a wonderful host !! We feel like home. Very excellent breakfast. The house and the rooms were very nice. Perfect service. We will recommend the Almanii B&B to others. Excellent ! Clean rooms, super breakfast, very nice people ! A nice BB well-situated in Dublin, a bedroom clean and cosy, a delicious full Irish breakfast, and a free car park on top of that. Very good value for money. A lovely B&B near Dublin (15 minutes by bus).Our room was clean and the bed was very comfortable. Mary is a smiling and nice host and her breakfast are fantastic.Great experience! Very warm welcome, delicious breakfast, everything was spotless and I would definitely go there again. Thank you Mary. 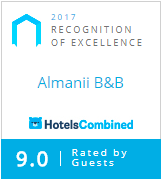 The Almanii B&B earns a five-star rating. Mary keeps guests well fed and housed and her dogs will keep them amused. We were delighted with our stay at this charming home. It was so convenient to our needs. Very nice stay. Clean room, great food, very accomodating host. Would stay again if in Dublin. A very lovely place to stay. Clean, modern, and comfortable. Our host, Robert, went out of his way to answer questions and to supply us with all the necessities. I wish the time of year could have afforded our checking out the gardens, which we could see from our window was wonderfully landscaped. If we are ever in Dublin again, we would definitely stay at Armanii B & B. After a hectic two-week tour of Italy, we arrived at the Almanii B and B for our last night before our flight back to the States. It felt like home! We were greeted so warmly by Mary, we actually felt more like family. And the beds were heavenly! We wished we could have stayed longer. Friendly host. Clean room. Great breakfast. Bel B & B comodo per i mezzi pubblici e per l'aeroporto. Ottima padrona di casa, una miniera di informazioni turistiche. Ottima colazione. Nulla di negativo.